Japan, or "Land of the rising sun", can feel proud of its flag, whose symbolism could be tracked back by several millennia. 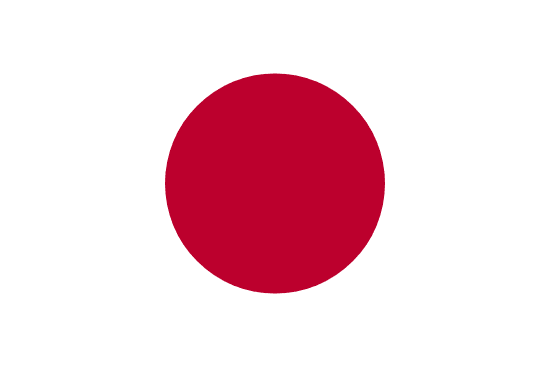 The red circle on a white background indicates a rising sun disc - so called Hinomaru in Japanese. The cult of sun enjoyed great attention there, Japanese emperors were said to be the descendants of a sun goddess Amaterasu. This symbol was drawn by samurais on ornamental fans called "gunsen" in the twelfth century already. In the 15th and 16th century, the symbol was used as a military insignia and it was displayed on military standards. When Japanese abandoned its policy of isolation in 1870 and began to make contact with other countries, they decided to use this ancient symbol as the central theme of its national flag.